Is wine-making an art or a craft? Vintners will tell you it’s both, and Smoky Mountain wine country mingles with the arts crowd this weekend in two events. The 4th Annual Wine Fest at Arrowmont School of Arts and Crafts happens Saturday, April 9, 1-6 pm. This highly successful event features the different wines of 17 local wineries, accompanied by culinary masterworks from local chefs as pairings. The school’s own art is on display in its own marvelous galleries. Meanwhile, on Friday, April 8, the Arts & Crafts Community celebrates the opening day of its Hands-On Gatlinburg 3-day festival by welcoming the evening Wine, Dine and Art Crawl – more smartly known as The Wine Tour. The Tour offers a taste of hors d’oeuvres at each of three Gatlinburg wineries. The Wine Fest is a perfect excuse to visit Arrowmont, as if one were needed. The school is a legend in Gatlinburg, with a historic presence dating back over 100 years, beginning as one of the Appalachian settlement schools responsible for preserving and teaching the culture of the region. The school is now internationally acclaimed for its visual arts education and renowned faculty. Anytime you’re in Gatlinburg it’s worth taking a break and strolling onto Arrowmont’s beautiful campus, and through its galleries. And on Saturday, Wine Fest makes it impossible to resist. The festival will include talks and demonstrations by top sommeliers and chefs from the area, teaching the finer points of wine and the food that pairs with it most perfectly. Whether you love wine, food or art – and why not all three? – Wine Fest will satisfy all your tastes, for a fun and memorable day. The Wine Tour on Friday evening makes it easy to be carried along in comfort. Nothing more fun than a group of aficionados being guided by experts on a more-or-less mystery tour. It’s a ready-made date night or group event for fun and bustle. The Wine Tour has grown in concept over time, and may now include restaurants along the way. And the Arts & Crafts Community offers a whole world in its own right to get lost in – so be glad for that tour guide. 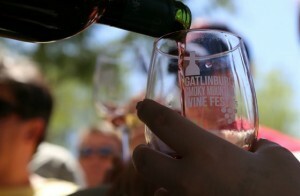 Three Gatlinburg wineries will present tastes of fine wine that you may not associate with the Smoky Mountains. Moonshine made Tennessee famous – and we have our highly popular ‘Shine distilleries to prove it – but the Smoky Mountain wine country is a growing thing, with now the beginning of a Wine Trail. When you consider there are annual events in Gatlinburg and Pigeon Forge entering their 40th year, it’s clear that the 4th Annual anything is a rank beginner. But wine has been coming on strong in the area. We hear that the Wine Tour is completely Sold Out, which only means that it will be bigger and better next year. As we often tell people, being in the cabin rental business we see many things that get booked very, very far in advance. So if you miss the Wine and Arts events this year, remember you’re nicely ahead of the curve to book early for next year.